‘Today, Equality Rights Group (ERG) calls for action on poverty in Gibraltar,’ the group states in a press communiqué. ‘And we call for action not least because an out of touch, inadequate and unacceptably secretive Social Security system speaks to the existence of numbers of people who are seriously at continuous risk of falling into or being stuck in the poverty trap. ‘For a wealthy society, with one of the highest GDPs in the world, that any semblance of poverty in our midst should be tolerated must shock us all. Because poverty is complex, and the reasons for it are many. And real people are affected every day. ‘Action on Poverty’ is the name of a new project campaign, launched today by ERG, with a full-page ad in the Gibraltar Chronicle (shown). The campaigning Human and Civil Rights NGO aims to build a non-partisan coalition of concerned Civil Society organisations and individuals around the issues. ‘We’ve taken the time over the past 18 months to methodically survey a number of research areas. ‘And we have been taken aback by what we have found: islands of poverty across various sectors, concealed from view to a large extent. Of course, no-one walks down Main Street with a t-shirt saying “My fridge is empty. I can’t afford to shop for food for a few days.’ Wherever poverty shows its face around the world, the poor prefer to blend in, rather than stand out. Our own Gibraltar brand of poverty is rarely extreme, thanks only to the support of our family system; but it is, nonetheless, numbingly routine and degrading for too many, especially for those without that backup. The consequences to society at large of these deficits in social security are multiple, contributing to underlying exclusionary and often harmful outcomes. 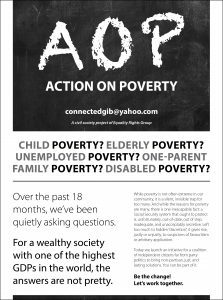 ‘And yet poverty is all too often child poverty, unemployed poverty, elderly poverty, disabled poverty, and one-parent family poverty. Not everyone in those categories is poor – people’s circumstances are not uniform. That’s why we speak of ‘islands of poverty’; and our findings so far point to a Social Security system which urgently needs a spring clean, a reform. It is also a barrier that systematically avoids public scrutiny through a structure built on the excessive ‘discretion’ of politicians and officials. This gives rise, justly or unjustly, to criticisms and suspicions of favouritism or arbitrary application. ‘All of this has to change, whichever political grouping is in power. ‘Prosperity must be justly distributed. Governments must invest to build more adequate structures in the protection of society. Hesitation must be replaced by the determination to bring Gibraltar up to par with our moral aspiration for this community. ‘Yet, given the decades of failure, it now falls to Civil Society to take up the challenge. ‘ERG is therefore committed to working with other independent social actors to prioritise the changes that are needed,’ the statement ended.